Richard Caveglia updated their profile information. Richard Caveglia and William Cope are now peers. 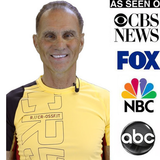 Richard Caveglia created the update The Be Bold Never Be Bold Online Wellness Club. Richard Caveglia changed their profile image.